The Garrard model RC60 record changer will play any number of records up to eight 10" and 12" mixed in any order. The player is supplied with spring mounting to prevent mechanical feedback occurring between the loudspeakers and the pick-up cartridge. The cabinet space required for fitting is 15.5 x 13 x 5.5 inches clearance above and 4.5 inches clearance below unit plate. 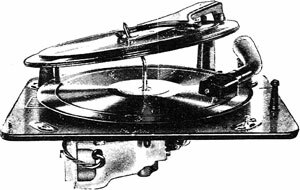 Garrard RC60 / RC-60 owners manual, service manuals and schematics are for reference only and the Vinyl Engine bears no responsibility for errors or other inaccuracies. The PDF files are provided under strict licence. Reproduction without prior permission or for financial gain is strictly prohibited. This website is not affiliated with or sponsored by Garrard.